Tobias tells me this shot is "Not quite the same as goths in hot weather, but there isn't a punksinhotweather.com, and the horse ads such charm to the shot! " 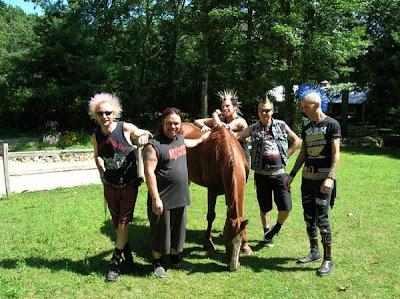 Couldn't agree more Tobias - watch your spikes on that mane punky cousins! Thats funny - great shot! Oh my goth! I know that guy on the left! That's Squints from The Bloodclots! Cyberpunk is goth?? Screw you then >:| unless of course you mean a cybergoth who calls themselves a cyberpunk to try and forgo the goth label; in which case, carry on I spose. Hahaha! It is the Bloodclots (a Seattle Punk Band)! They still look like that. How funny! You should see some people wearing the heavily riveted jackets in the summer. It's hilarious! At least punks are allowed to be in sun. In Seattle we all look that pale.